Cleaning blinds is a job that often gets overlooked but they can easily become quickly mucky if they're not given a once over every now and then. Whether you're tackling dusty bedroom blinds, seriously food-speckled kitchen blinds, or blinds grubby with fingerprints (blame the children), our guide will take you step by step through the blind cleaning process. We'll look at all blind types, too, and tell you how to clean shutters as well. Once you're done, find more step by step cleaning guides and hacks on our dedicated hub page. Take a look at the Real Homes pick of the 50 best cleaning products for your home, too. How often should you clean blinds? Simply fill a small bucket or washing up bowl with a mixture of one part white vinegar and one part warm water, and then use a clean microfibre cloth (or your old sock) to wipe metal, PVC or painted surfaces carefully. Turn the blinds the other way and repeat. Allow to air dry; in doing so, the vinegary smell will disappear. Find more ways to clean your house with vinegar in our guide. Get the steam cleaner up and running and double check on an unseen part of the blind that the steam won't cause warping or discolouration of fabric. You'll need to allow the part of the blind you've tested to dry thoroughly to be sure. Once done, steam the blind's material to remove stains, grime and dust. Allow to dry before retracting. This method is especially useful for removing mould from blinds that are in a damp room – a bathroom, perhaps. Find more ways to get rid of mould in our guide. Inherited your house from a smoker? Like to throw lively parties? Or perhaps you're just a fan of grilling or frying meat and the smell of smoke has ingrained itself into your blinds. Don't be fooled – even metal and wooden blinds and shutters can hold on to strong smells, which becomes ingrained in the dust on them. For these types of blinds, follow the instructions below. For fabric blinds, it's back to our old friend bicarbonate of soda – or baking soda. Simply remove the blinds, lay them out flat on the floor and sprinkle liberally with bicarbonate of soda. Allow to soak in for as long as possible – an hour minimum, overnight if possible – then shade off or very (very) gently vacuum the powder off and rehang. The smell should have disappeared. Find more ways to clean with bicarbonate of soda with our guide. Plain or pale-coloured roller blinds tend to show stains and marks more obviously than patterned or dark-coloured roller blinds, so if you're shopping for roller blinds in future, always look for ones made from a fabric that can be wiped clean for easier maintenance. Whatever the fabric of a roller blind, regular cleaning will keep it in good condition. First open the blind fully. Then using the soft brush vacuum attachment and the lowest power setting, carefully vacuum in downwards, sweeping motions, keeping the brush attachment just off the blind's fabric, being careful not to pull at the fabric. Next, carefully wipe in a downwards motion from top to bottom with a just-damp cloth. To remove stains from roller blinds, treat the fabric much like you would when cleaning upholstery, but stick to these general guidelines: use gentle products that won't leach colour from the blind's fabric; experiment with any cleaning products first on the least seen part of the blind first; dab, don't rub, as this in itself can warp the fabric. Choose the gentlest baby wipes you can find to carefully dab at the stain on the blind's fabric. Upholstery wipes can be a good stain treatment; again, wipe gently and pick one that suits your blind's fabric. 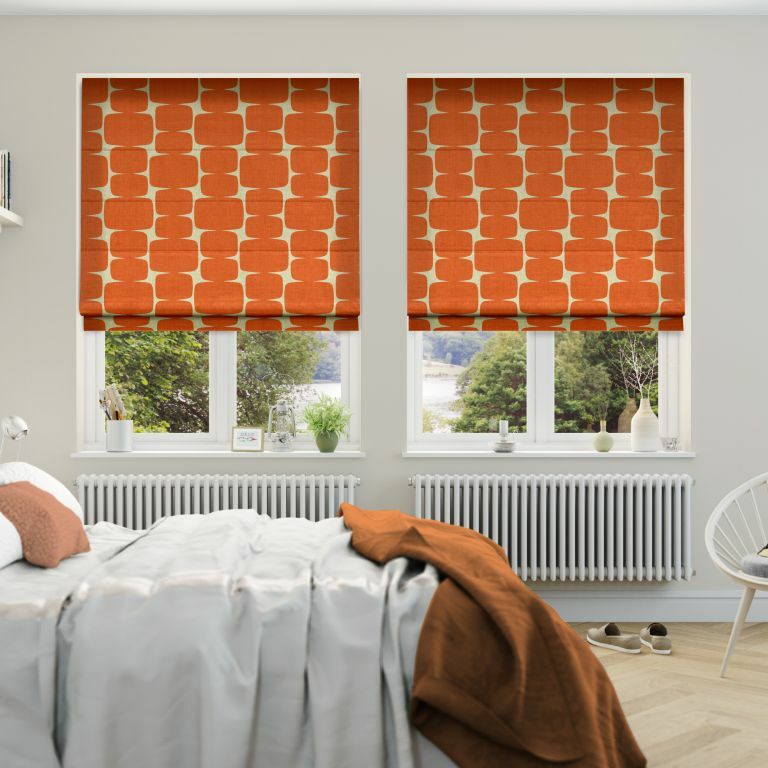 Find out more about buying the best roller blinds in our buyer's guide. The best way to keep Roman blinds looking good is to clean them regularly in the following way. Open the blind fully, and vacuum using the same method as above for cleaning roller blinds. Concentrate on the bottom and sides of your Roman blinds if they brush the edges of the window sill and frame as they'll gather more dust over time. Once they've been vacuumed, use a damp cloth, as above for cleaning roller blinds to remove excess dust and easy to remove stains. You can try the methods above for removing more stubborn stains, but it's also worth using a fabric stain remover specific to your blind's material, following the manufacturer's instructions carefully. Ensure you test the products on an unseen part of the blind first to ensure colour doesn't leach with application. If stains are stubborn or the fabric the Roman blinds are made from suffers from colour run, it may be best to have your blinds professionally dry cleaned once in a while. Check for a dry clean label before you go to the trouble of taking the blinds down – or failing that, take one blind down of a set and check the fabric is dry-cleanable. Find out more about buying the best Roman blinds in our buyer's guide. Vertical blinds are much easier to keep clean than fabric blinds, since dust is less likely to cling to manmade fabrics, such as PVC. A weekly dusting with a feather duster and a wipe over with a damp cloth (or sock) should be all they need. Baby wipes or upholstery wipes – or even a soapy cloth – should easily remove stains, too. As with all blinds, don't forget to gently vacuum or dust the headrail or pelmet, since dust will sit on it unseen. Metal Venetian blinds are easy to clean but do get dusty – and when they do, it's really obvious. And, if the blinds are in a kitchen, that dust will soon turn to greasy grime, so it's really worth keeping on top of regular light cleaning to avoid having to do a thorough monthly clean. Best approach? Once a week, close the Venetian blind and use a feather duster to give it a light dusting. Next, open and close the blind in the opposite direction to clean the other side of the slats. This will remove the majority of the dust, fast. For a more thorough clean, dust with a Venetian blind cleaning tool – a natty piece of cleaning kit that will cut down how much time and effort you spend. Or, this is where an old sock really comes into its own. Work from the middle of each slat outwards to minimise the spread of dust. Once dusted, use washing up liquid in hot water or a good quality window cleaning product (see our guides to find the best) to gently wipe the slats, being careful not to bow them. Dry with a lint-free cloth – microfibre cloths are the best. For quick results, use your vacuum cleaner on a lower power setting, keeping the upholstery attachment just shy of the slats so that you don't damage them. If the Venetian blinds are really dirty, you could unattach them and put them in a bath full of soapy, warm water. Lay a towel beneath them so they don't scratch the bath, and after cleaning each slat with a soft brush or sponge, drain the bath and rinse off with the shower attachment. Try to keep the headrail out of the bath so that you don't get the mechanisms wet. Allow to dry thoroughly before rehanging. You can use the majority of the dry techniques above to clean wooden Venetian blinds. Unlike metal Venetians, those made from wood must not be overly wetted or dunked in water or the wood will warp and swell. You might also like to avoid using strong cleaning products on them, since this too can damage the finish. Instead, stick to using cleaning solutions that you'd apply to wooden furniture, or just use a slightly damp cloth to work off stains, and ensure blinds dry fully before retracting them. Find out more helpful info about buying Venetian blinds in our guide. Cleaning shutters can be approached much like cleaning Venetian blinds. If your shutters are wooden, take the same precautions as with wooden Venetians, keeping to dry or just-damp cleaning methods. If, however, they are painted, you can be a little more gung-ho with your approach. Wipes are good for removing fingermarks and stains, but a soapy cloth will work just as well; a lint-free cloth in either case is handy for removing smudges the cleaning solutions leave behind and will give your shutters a decent shine. Shutter cleaning brushes are an ingenious way to cut down on cleaning time. For more on choosing shutters for your home, see our guide. Conservatory blinds tend to gather not just dust but dead insects over the course of a summer. With this in mind, it's a good idea to clean them around Easter and again around September/October. Doing so will keep them looking good, will ensure you're not showered with debris when you pull them back and forth, and will prolong the fabric's life. Start by removing dust and debris from behind the fully-opened blinds, either with the upholstery attachment of your vacuum cleaner if you can reach behind them, or by blowing them out on to the floor with a hairdryer or a leaf blower on a gentle setting. Either way, you'll want to move the furniture beneath while you're doing this, and get someone to hold on to a sturdy step ladder for you. Next, gently vacuum the visible side of the blinds, being careful not to tug at the fabric; the vacuum needs to be on the lowest power setting and you should keep the upholstery attachment just shy of the blind. This will be step one if you're cleaning loft window blinds. If you're nervous of doing this (or can't reach), opt for a feather duster or slightly damp cloth, which can be wiped gently over the surface of the blinds' fabric. See conservatory blind design ideas and loft and glazed extension roof blinds in our guides.